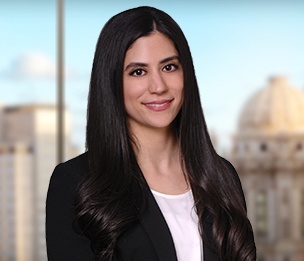 Ana Ayrempour is an associate in Dykema's Chicago office. Ana focuses her practice on Corporate Finance matters, with a particular focus on innovation and technology transactions. Prior to joining Dykema, Ana served as Counsel for General Motors, where she supported the Global Connected Customer Experience, Chief Data Analytics Office, and Global Innovation teams. Prior to her time at General Motors, Ana served as a technology attorney at Allstate Insurance Company on the Investments and Business Transactions team, where she supported the sales and procurement teams, as well as Arity (Allstate's start-up data company). While in law school, Ana served as an intern for Rush Communications and All Def Digital in New York, focusing on corporate transactions. Ana also interned for the Honorable Anthony Kyriakopolous in the Circuit Court of Cook County, as well as the Cook County Public Defender's office.